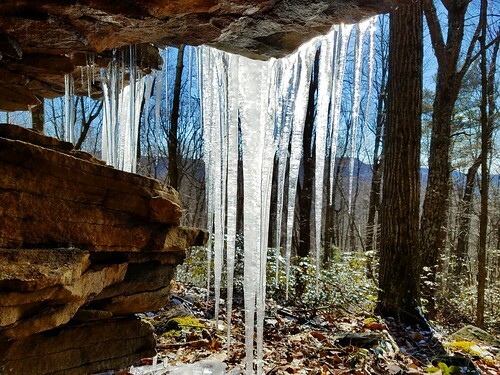 Rock shelters above Stony Run. 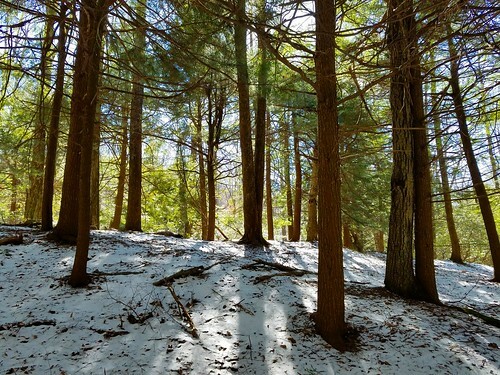 The Stony Run Trail is one of the Loyalsock State Forest’s little known trails. It is also one I’ve always enjoyed hiking. 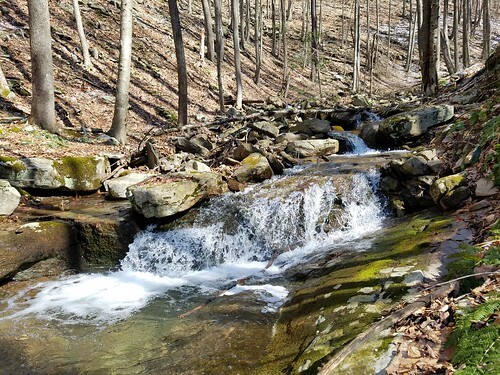 I returned recently to hike part of the trail and to do some off trail exploration in the Stony Run Gorge. I parked at the Hillsgrove maintenance/ranger station and followed the red blazed Old House Trail, which began a short distance down the road near the cabin. I crossed Dry Run, getting wet feet along the way. Dry Run does not have a bridge, so do not attempt to cross in high water. 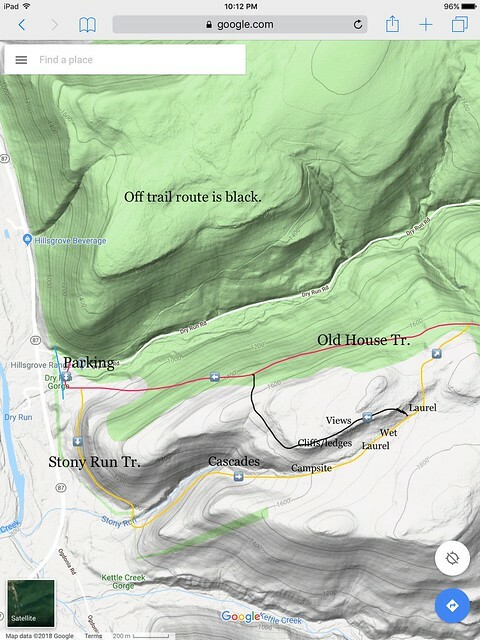 The Old House Trail, which is also a part of the bridle trail system, curved up into a scenic pine forest, and then I turned right onto the yellow Stony Run Trail. This trail crossed a rocky talus slope and then dropped into Stony Run, crossing the tumbling run without a bridge. The trail is faint in places and the blazes are faded, but the trail can be followed. The trail then followed a grade and went up the side of the gorge, above the creek. But I had a different way in mind. I decided to hike off trail and just go up Stony Run itself. I soon entered a gorge with non-stop cascades and pools, but no sizeable falls. The gorge narrowed as I climbed and I soon saw some bedrock cascades as cliffs rose above me. I reached a hemlock forest with more beautiful cascades and passed a nice campsite, where I rejoined the Stony Run Trail. The trail entered thick laurel, but there was a clear passage. This would be a great hike in June to see the laurel bloom. The trail became wet as I crossed Stony Run, and also more overgrown, but I was able to stay on the trail. 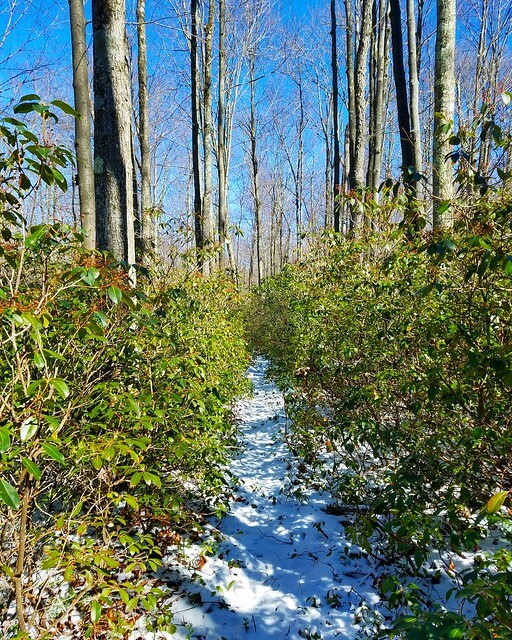 The trail continued, left the laurel, and entered an open hardwood forest. However, I left the trail again, following a bushwhack along a cliff line. 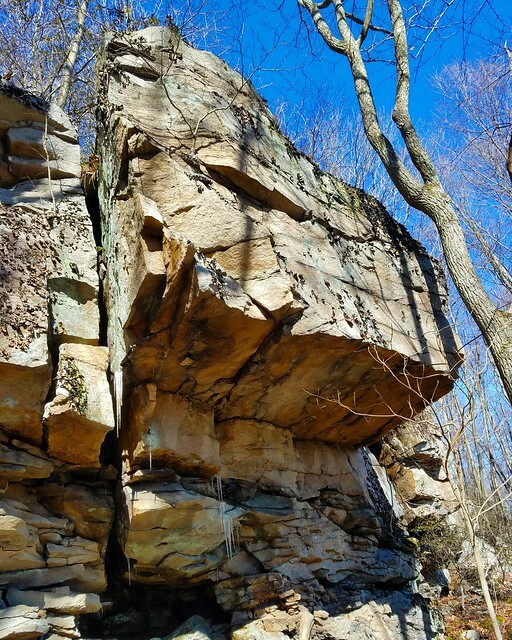 There are cliffs on the north rim of Stony Run Gorge. At first, the laurel was very thick, but became more open as I reached the cliffs. There were beautiful overhangs, a cave, and boulders. 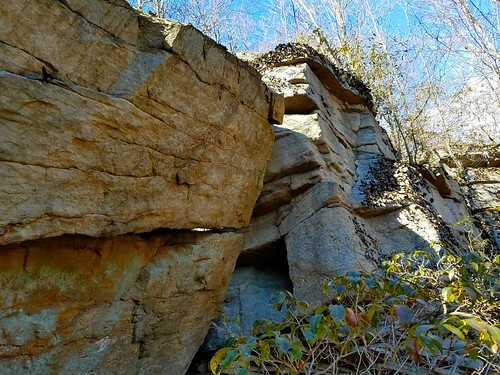 I found a way to the top of the cliffs, battling laurel, where there was a more open cliff line and nice hiking along a well established bear path. I also enjoyed three nice views across the gorge, but the views were not expansive. I continued west along the cliffs, but the trees blocked any further views. I dropped down a little into a drainage and explored some more outcrops. I then entered a beautiful, open hardwood forest with large, towering trees. I made a note to return in the summer. I dropped down to the red Old House Trail and followed the grade back to my car. On my drive out, I saw Andrea Falls and the rebuilt CCC era Dry Run picnic pavilions with its heavy timber beams, a beautiful spot for a get together. 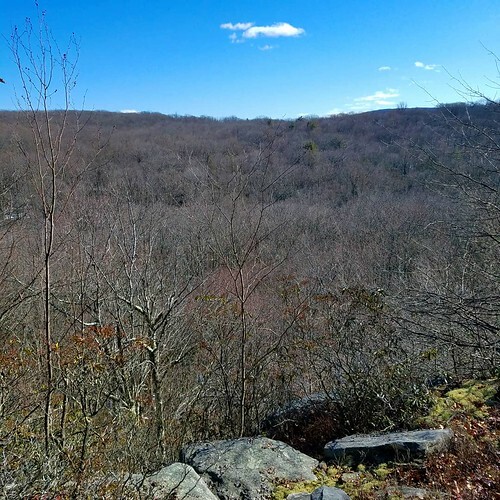 If you don’t want to bushwhack, just hike the Old House and Stony Run Trails Loop, it is a great hike with isolation, cascades, hemlocks, laurel, rock outcrops, and a nice campsite. The whole loop is almost five miles. This loop is described in Hike No. 46 in Hiking the Endless Mountains. 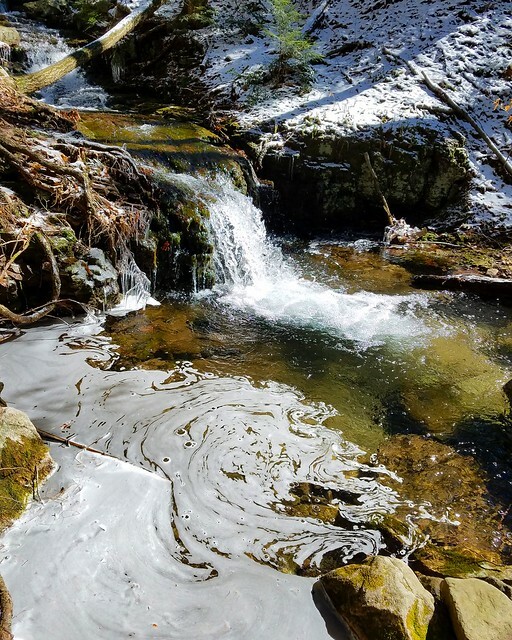 This entry was posted in Uncategorized and tagged andrea falls, Endless Mountains, Hiking, loyalsock state forest, pennsylvania, rocks by endlessmountains. Bookmark the permalink.